BRISTOL, U.K. (BRAIN) — Tailfin has launched a new rear bag for mountain bikes on Kickstarter. 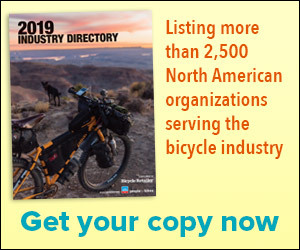 WILTON, Conn. (BRAIN) — GT Bicycles has introduced a new version of its Fury downhill model that can be set up for 190 millimeters of travel with 29-inch wheels or 200 millimeters in 27.5-inch mode. SEYMOUR, Conn. (BRAIN) — Thule, which launched its first hydration pack line last year, has added two new collections for 2019. The new Thule Rail is designed for aggressive trail riding and enduro racing, while the Thule UpTake is made for biking, hiking or skiing. SAN FRANCISCO (BRAIN) — Strava has broken up its premium membership program into three packages, available as a bundle or a la carte.